This aerospace corporation is an international pioneer in the aerospace industry. They are a leader in designing, manufacturing and delivering aerospace products, services and solutions to customers on a global scale. A commercial aircraft manufacturer, with Space and Defence as well as Helicopters Divisions, this aerospace corporation is a worldwide leader in aeronautics and space technology development and manufacture. The company has aircraft and helicopter final assembly lines across various continents, and has achieved a more than six-fold order book increase in the last two decades. As part of their Digital Transformation and DevOps Strategy, the aerospace corporation was developing a “Public Cloud Platform” (PCP) self-service portal for projects and suppliers. They identified and chose Amazon Web Services (AWS) as their preferred Public Cloud provider. Migrating applications to Cloud with minimal changes is intended to provide the benefits of a secured and cost-efficient infrastructure. The main purpose is to make Cloud easy and secure for everyone at the aerospace corporation so they can make the adoption of a “Cloud First” strategy a reality. To achieve this, they put together a project team to develop an Application Programming Interface (API) to act as a ‘front door’ for applications to access data, business logic, or functionality from back-end services running on Amazon Elastic Compute Cloud (Amazon EC2), code running on AWS Lambda, or any Web application. By providing a micro-service solution, the Public Cloud Platform project is concerned with reducing constraints from a highly integrated architectural environment used at the aerospace corporation. Shifting towards an iterative and incremental approach such as Agile demands increased integration and regression testing, with regular APIs/builds each requiring regression testing and testing of the new API functionality. Having a relatively small project team mostly focussing on development without dedicated testers often poses concerns for quality, and being fairly new to the Agile approach, PCP needed expertise in ramping up the quality and adopting early and consistent testing into their project. Constantly changing test requirements (GUI / API / 3-level security) adjusting to Business Requirements and Architectural (both AWS & Security-level) changes. APIs of this complexity and scale with frequent changes to the schemas mandate significant Integration and Regression testing. Limited in-house capability and access to specialised, multi-functional QA and testing expertise at varying levels and specialisms. Lack of a test-driven approach, plus inability to leverage best practice, test assets and tools. The PCP management team asked Planit to propose services to assess the skills requirement and tools options, then to help design and implement a strategy that will allow the team to become self-sufficient in testing. Expertise in managing delivery of high quality, impactful testing of large scale complex solutions, by providing flexible and cost-effective approaches. Independence and pure focus on quality assurance. Permanent resourcing model supports guaranteed quality and continuity of Planit staff and processes. Transparency in optimising the costs involved with the Test Strategy and Automation activities. Planit assigned a Senior Technical Consultant to work closely with the project team to put together a documented Testing Strategy and Automation Approach. This included a testing tools evaluation and Proof-Of-Concept using Planit’s standard process. Once refined and agreed, an initial secure API testing framework was developed and integrated into the Project development, CI/CD and Release processes – in particular, the “bug” or anomaly reporting and fixing process. A scalable solution was provided, avoiding many of the costs and difficulties of setting-up and running an in-house API testing capability. With the API test automation framework demonstrated, Planit provided another experienced Consultant to ensure a repeatable test process, documentation, hand-over and training of the in-house team. This team profile optimises costs to Planit’s clients. Planit’s UK staff worked on-site at the aerospace corporation facility in a different country. Such co- location with developers and other key stakeholders of the PCP team helps assure an effective approach to delivery. Planit built a strong and trusting relationship with the aerospace corporation’s PCP team, based on mutual understanding and drive towards the common goal of ‘Quality First’ philosophy to the development lifecycle. The Planit team put together a documented Test Strategy and Automation Approach. This specified a detailed solution for Functional, Integration and Regression testing of the Public Cloud Platform portal API for Phase 1 Release. Agile Test Process – develop and implement an Agile Testing Process which will lead to consistent practices, increasing the quality of delivered products. The Agile Tester Mindset – Quality should not be an afterthought for the testing stage, and not the sole responsibility of the testers. Rather, it is the team’s responsibility, and a testing-aware approach is needed from early in every development cycle. Through its partnership with the Planit testing team, the aerospace corporation ensured changing business requirements were implemented successfully, managing and minimising the risk of failure and gaining confidence to proceed further on with additional PEN Testing (engagement with other vendors). The testing was highly successful. In the areas covered: important problems were found and fixed in good time for the critical Penetration test and Release 1 Go-Live. As a result, the aerospace corporation had the confidence to push ahead with their planned Release 2 initiatives. 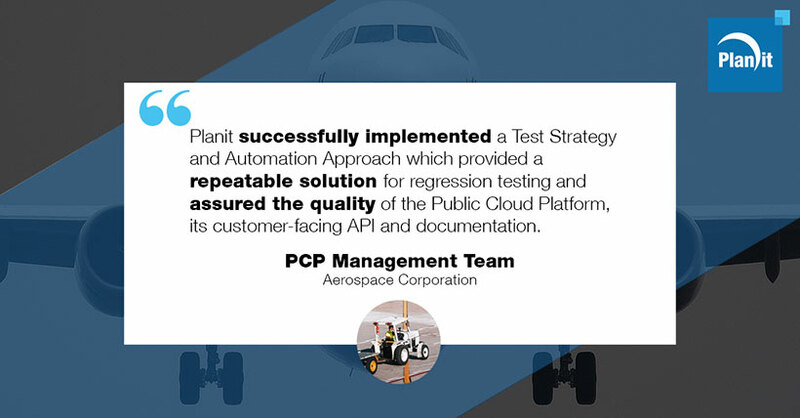 Planit was able to successfully implement an agreed Test Strategy and Automation Approach, which provided a repeatable solution for regression testing and assured the quality of the aerospace corporation's Public Cloud Platform, its customer-facing API and documentation. This was provided via Planit’s Technical Services co-locating dedicated consultants from the UK to the Agile project team, providing effective quality services in a cost-efficient manner. This allowed the aerospace corporation to deliver their Phase 1 of Public Cloud Platform services reliably, and manage their API testing solution going forward with hand-over and training.